For the Midway game of a similar name, see Space Invaders II. 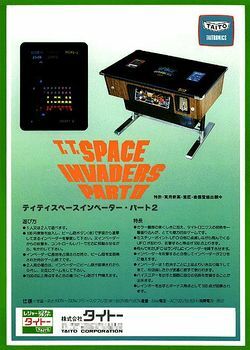 Space Invaders Part II is a fixed shooter arcade game which was released by Taito Corporation in 1979; it utilizes one Intel 8080 microprocessor (running at: 2 MHz), with discrete components and a Texas Instruments SN-76477 for audio. It was later licensed to Midway Games for US manufacture and distribution in 1980 under the name Space Invaders Deluxe - however, the title screen on this version still says "Space Invaders Part II", when it is displayed during the game's attract sequence. This version also reduced the point value of the new "flashing" spaceships, from 500 points to 200. The gameplay is much the same as that of the original, only with several new features; there is now two different types of spaceships, the original (which are now coloured magenta instead of red, and are worth between 50 and 300 points when hit), and a new "flashing" type, which are also coloured magenta, can only be hit when visible and are worth 500 points. The spaceships also now possess the ability to drop in reinforcement invaders, to make a stage go on for longer - and from the fourth (the second in the Midway licensed version) stage onwards, there will be "gaps" in the formation to accommodate the fact that some of the (20-point) invaders will split into two smaller ones when hit. This page was last edited on 13 May 2014, at 17:51.